There's no surprise that these amazing figures needed a second wave of shipments. I was able to snag only a few of these simply stunning Haruhi figures. Mikuru in particular is my favorite (saved one for myself ^^;) and she's also sold out everywhere. All of them have real (and real delicate) fishnet stockings and stand, well... sit or lay roughly 13 inches across or tall. As you can see, I was also able to snag the new Emiri and Ryoko bunnies as well. I'm proud to announce I have them (Mikuru and Haruhi) w/the others (Emiri & Ryoko) in shipment right now. 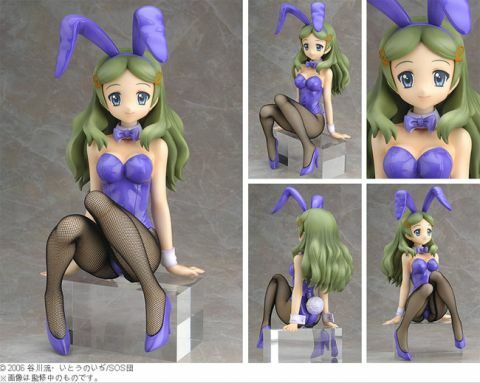 Click HERE to order Haruhi, HERE for Mikuru, HERE for Emiri Kimidori, and HERE for Ryoko Asakura . Since they are over $100, the shipping is automatically free. Grab them while you can or just gander at their beauty in these pics.